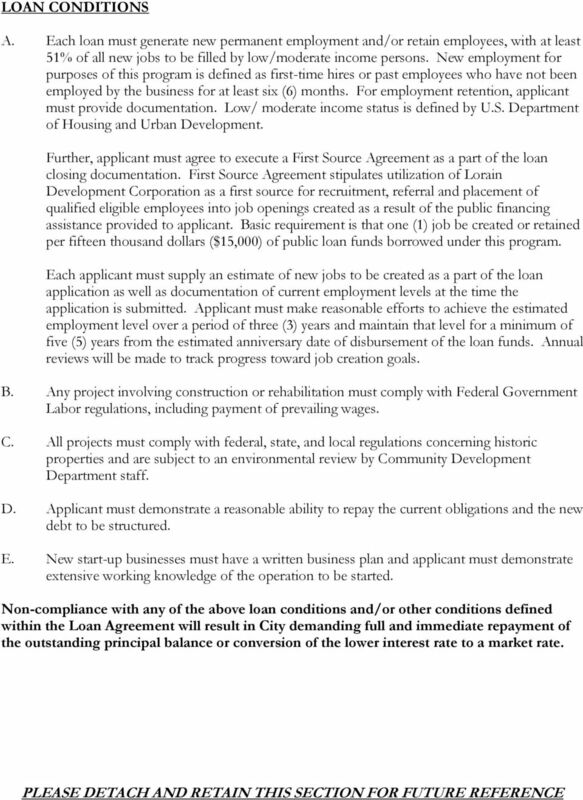 Download "BUSINESS REVOLVING LOAN FUND PROGRAM ADMINISTRATIVE GUIDELINES"
1 BUSINESS REVOLVING LOAN FUND PROGRAM ADMINISTRATIVE GUIDELINES OBJECTIVES: A. Stimulate development and expansion of new and existing small and medium-sized businesses located within the City of Lorain. B. Provide incentives to private-sector financing sources, to encourage job creation and retention and increase the tax base for the City of Lorain. 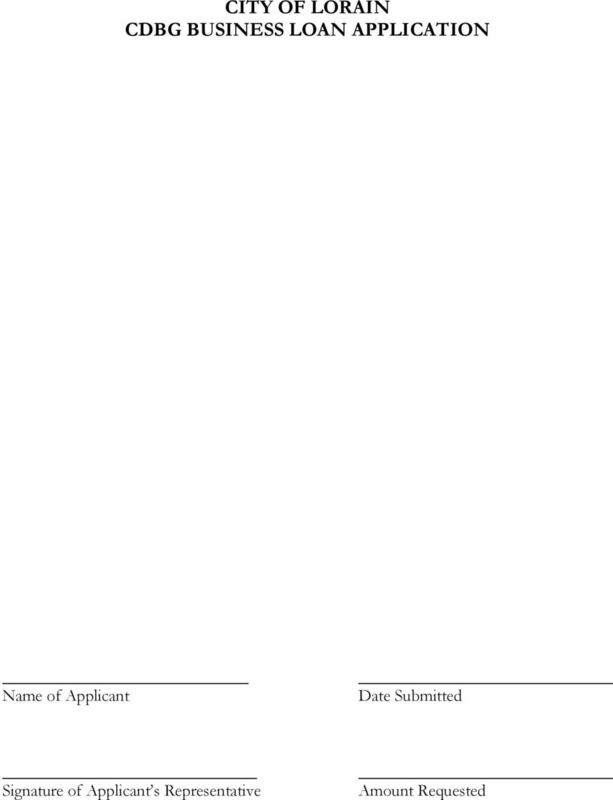 ELIGIBLE APPLICANTS: A. 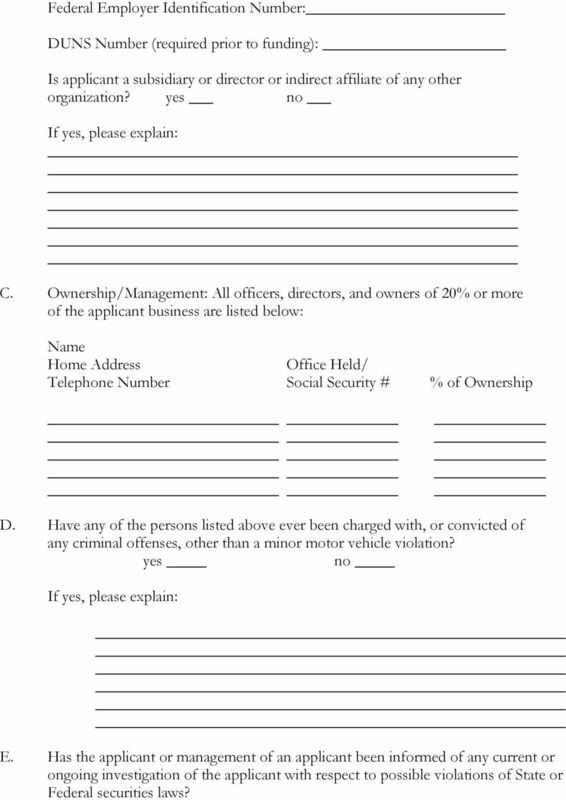 Applicant must be a for-profit sole proprietorship, partnership, limited liability company, or a corporation. B. Manufacturing, wholesaling or commercial enterprises are eligible when, in the discretion of the Loan Committee, sufficient new jobs will be generated to warrant awarding the loan. C. Real estate investment is limited to owner/user applicants only. ELIGIBLE ACTIVITIES: A. Land costs, including engineering, legal, grading, testing, site mapping and related costs associated with the preparation of land. B. Building costs, including acquisition, engineering, architectural, legal and other soft costs related to construction or rehabilitation. C. Acquisition of or improvements to an existing structure including, but not limited to, the rehabilitation, renovation or remodeling necessary to conduct business in said structure. D. Purchase of machinery, equipment, furniture and fixtures, including installation and delivery. E. Working Capital. 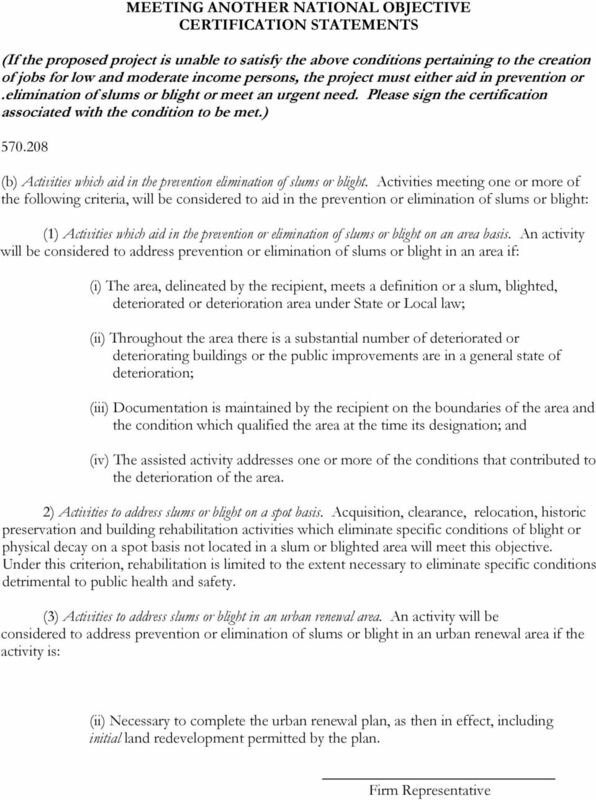 INELIGIBLE ACTIVITIES A. Debt refinancing; B. Real estate speculation; C. Rolling stock (i.e. vans, trucks, vehicles). APPLICATION PROCESS Application shall be submitted two (2) weeks prior to loan board meeting (meetings are held 2nd Monday of each month) for staff analysis. 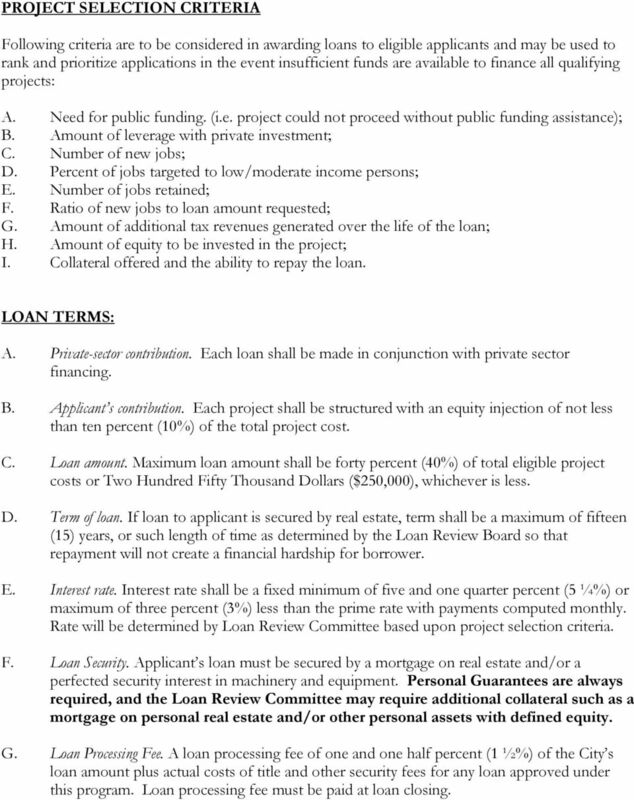 Only complete applications will be presented to Loan Review Committee. 2 PROJECT SELECTION CRITERIA Following criteria are to be considered in awarding loans to eligible applicants and may be used to rank and prioritize applications in the event insufficient funds are available to finance all qualifying projects: A. Need for public funding. (i.e. 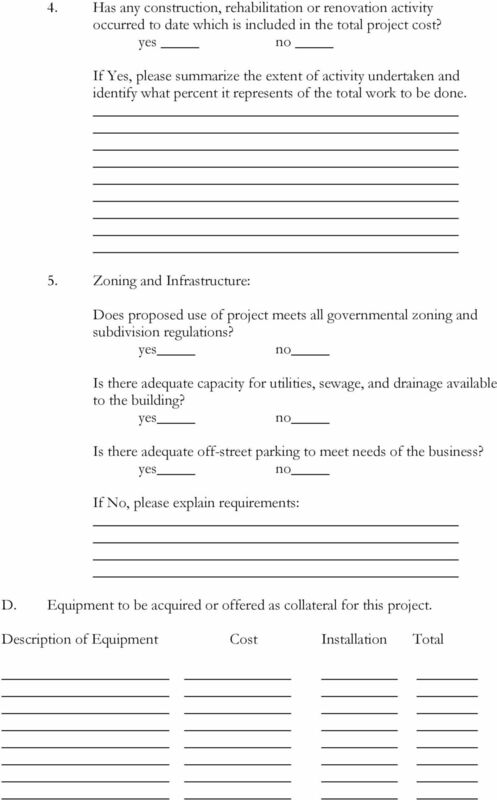 project could not proceed without public funding assistance); B. Amount of leverage with private investment; C. Number of new jobs; D. Percent of jobs targeted to low/moderate income persons; E. Number of jobs retained; F. Ratio of new jobs to loan amount requested; G. Amount of additional tax revenues generated over the life of the loan; H. Amount of equity to be invested in the project; I. Collateral offered and the ability to repay the loan. LOAN TERMS: A. Private-sector contribution. Each loan shall be made in conjunction with private sector financing. B. Applicant s contribution. Each project shall be structured with an equity injection of not less than ten percent (10%) of the total project cost. C. Loan amount. Maximum loan amount shall be forty percent (40%) of total eligible project costs or Two Hundred Fifty Thousand Dollars ($250,000), whichever is less. D. Term of loan. If loan to applicant is secured by real estate, term shall be a maximum of fifteen (15) years, or such length of time as determined by the Loan Review Board so that repayment will not create a financial hardship for borrower. E. Interest rate. Interest rate shall be a fixed minimum of five and one quarter percent (5 ¼%) or maximum of three percent (3%) less than the prime rate with payments computed monthly. Rate will be determined by Loan Review Committee based upon project selection criteria. F. Loan Security. Applicant s loan must be secured by a mortgage on real estate and/or a perfected security interest in machinery and equipment. Personal Guarantees are always required, and the Loan Review Committee may require additional collateral such as a mortgage on personal real estate and/or other personal assets with defined equity. G. Loan Processing Fee. A loan processing fee of one and one half percent (1 ½%) of the City s loan amount plus actual costs of title and other security fees for any loan approved under this program. Loan processing fee must be paid at loan closing. 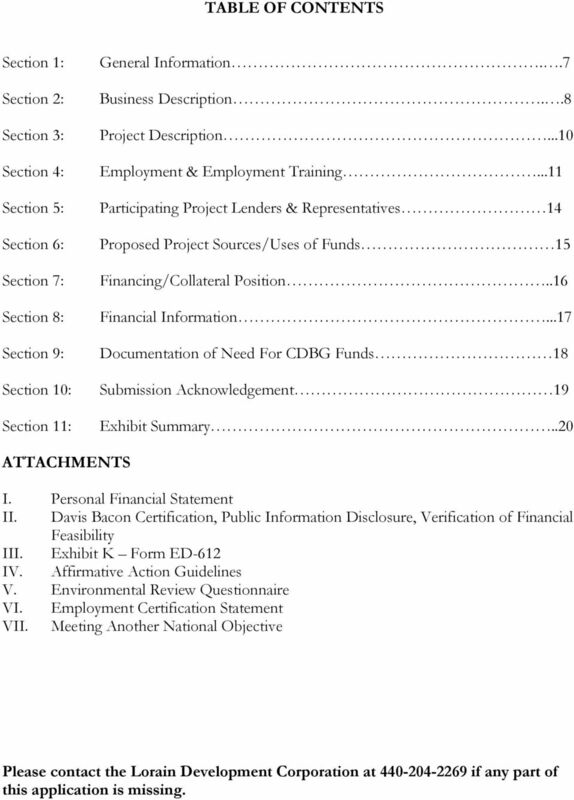 5 TABLE OF CONTENTS Section 1: Section 2: Section 3: Section 4: Section 5: Section 6: Section 7: Section 8: Section 9: Section 10: Section 11: General Information..7 Business Description..8 Project Description...10 Employment & Employment Training...11 Participating Project Lenders & Representatives 14 Proposed Project Sources/Uses of Funds 15 Financing/Collateral Position..16 Financial Information...17 Documentation of Need For CDBG Funds 18 Submission Acknowledgement 19 Exhibit Summary..20 ATTACHMENTS I. Personal Financial Statement II. 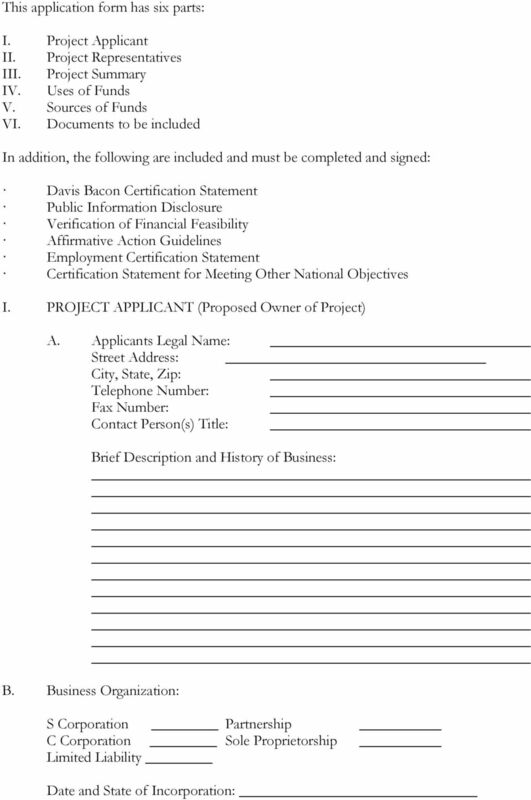 Davis Bacon Certification, Public Information Disclosure, Verification of Financial Feasibility III. Exhibit K Form ED-612 IV. 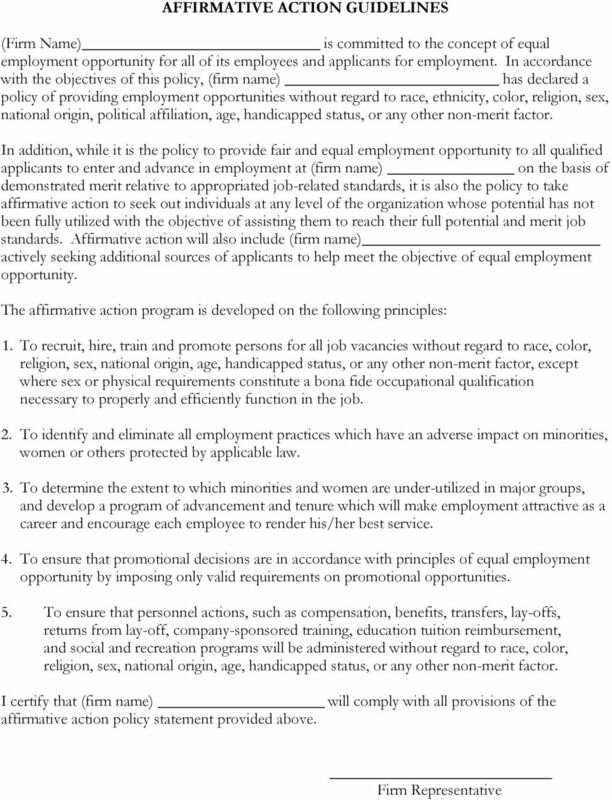 Affirmative Action Guidelines V. Environmental Review Questionnaire VI. 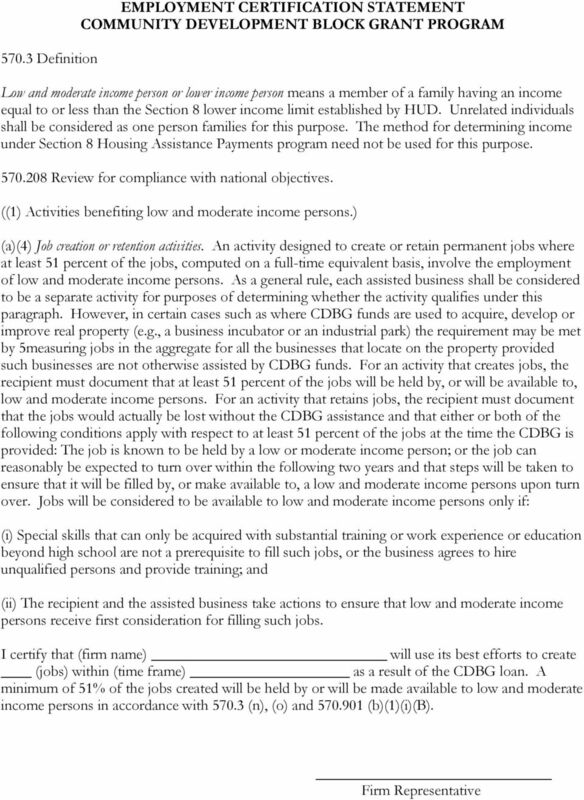 Employment Certification Statement VII. 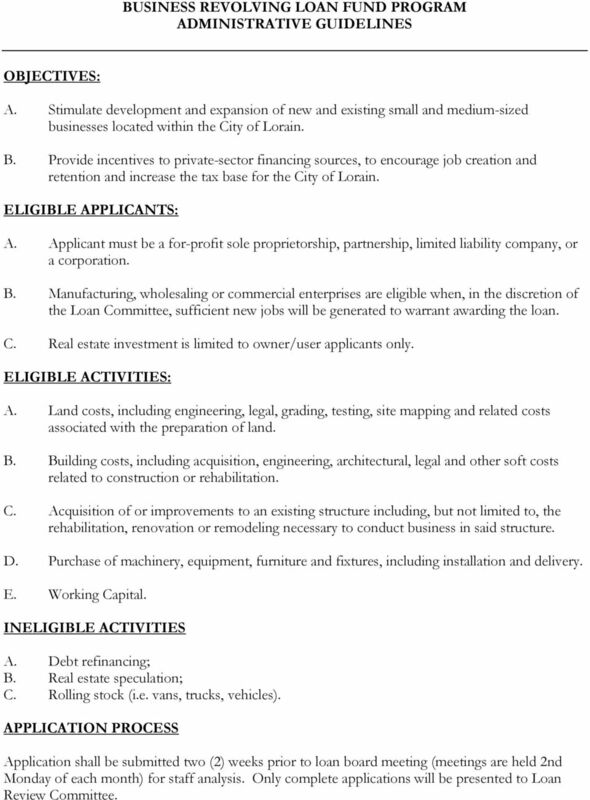 Meeting Another National Objective Please contact the Lorain Development Corporation at if any part of this application is missing. 7 Federal Employer Identification Number: DUNS Number (required prior to funding): _ Is applicant a subsidiary or director or indirect affiliate of any other organization? yes no If yes, please explain: C. Ownership/Management: All officers, directors, and owners of 20% or more of the applicant business are listed below: Name Home Address Office Held/ Telephone Number Social Security # % of Ownership D. Have any of the persons listed above ever been charged with, or convicted of any criminal offenses, other than a minor motor vehicle violation? yes no If yes, please explain: E. Has the applicant or management of an applicant been informed of any current or ongoing investigation of the applicant with respect to possible violations of State or Federal securities laws? 9 III. PROJECT SUMMARY A. Brief narrative description of the project: B. Location of Proposed Project: Street City, State, Zip C. Buildings: 1. Does project involve the acquisition of existing building(s) or land? yes no 2. If Yes, has site control been established? yes no Option to purchase yes no Lease yes no Purchased yes no 3. Does project consist of additions, renovations or exterior alterations to existing buildings? yes no If Yes, please summarize the nature of the improvements. 12 VI. PLEASE ATTACH THE FOLLOWING DOCUMENTS TO THIS APPLICATION: A. 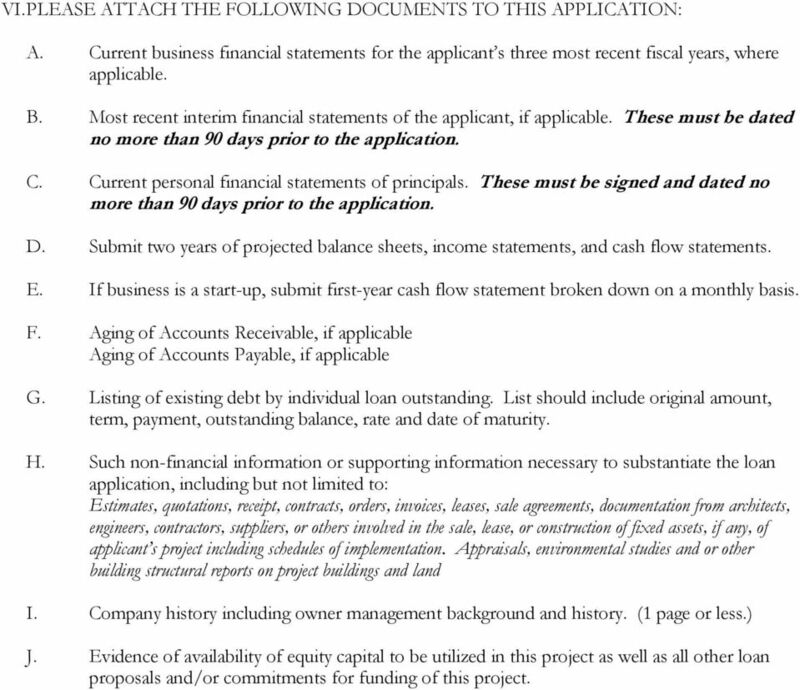 Current business financial statements for the applicant s three most recent fiscal years, where applicable. B. 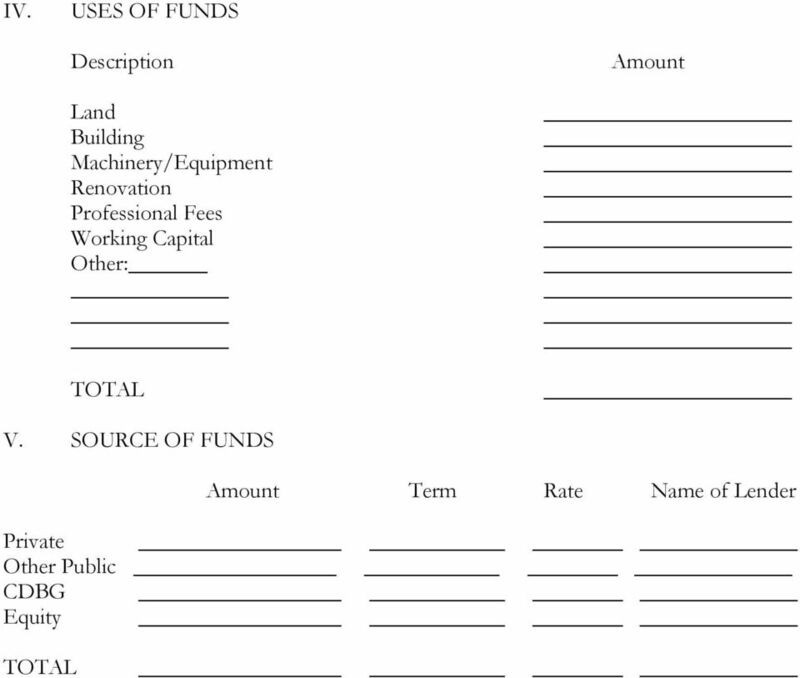 Most recent interim financial statements of the applicant, if applicable. These must be dated no more than 90 days prior to the application. 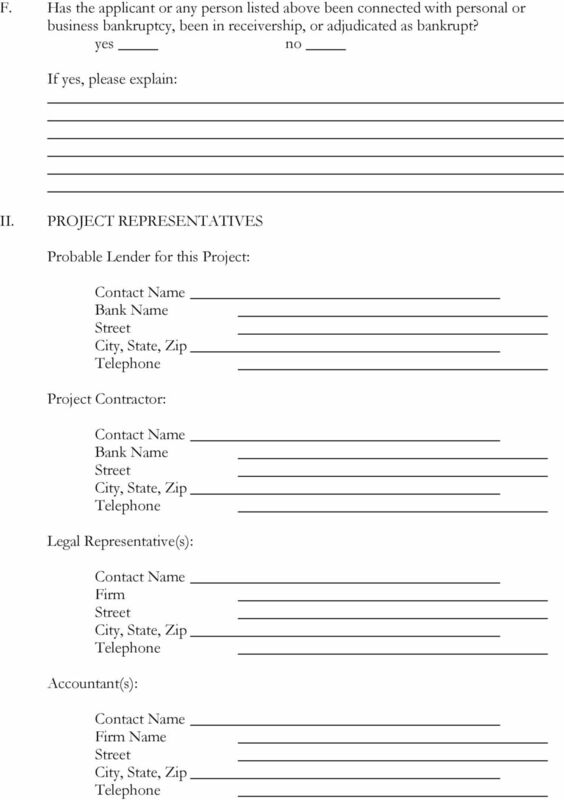 C. Current personal financial statements of principals. These must be signed and dated no more than 90 days prior to the application. D. Submit two years of projected balance sheets, income statements, and cash flow statements. E. If business is a start-up, submit first-year cash flow statement broken down on a monthly basis. F. Aging of Accounts Receivable, if applicable Aging of Accounts Payable, if applicable G. Listing of existing debt by individual loan outstanding. List should include original amount, term, payment, outstanding balance, rate and date of maturity. H. Such non-financial information or supporting information necessary to substantiate the loan application, including but not limited to: Estimates, quotations, receipt, contracts, orders, invoices, leases, sale agreements, documentation from architects, engineers, contractors, suppliers, or others involved in the sale, lease, or construction of fixed assets, if any, of applicant s project including schedules of implementation. 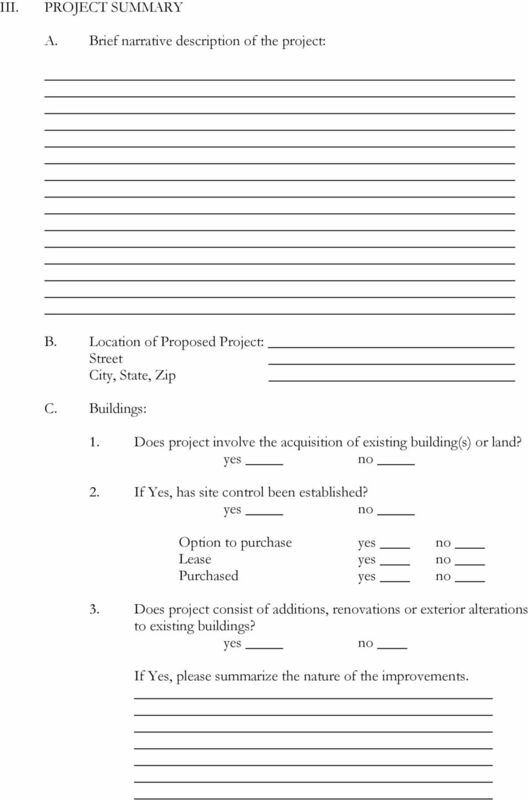 Appraisals, environmental studies and or other building structural reports on project buildings and land I. Company history including owner management background and history. (1 page or less.) J. Evidence of availability of equity capital to be utilized in this project as well as all other loan proposals and/or commitments for funding of this project. 17 *(c) Activities designed to meet community development needs having a particular urgency. 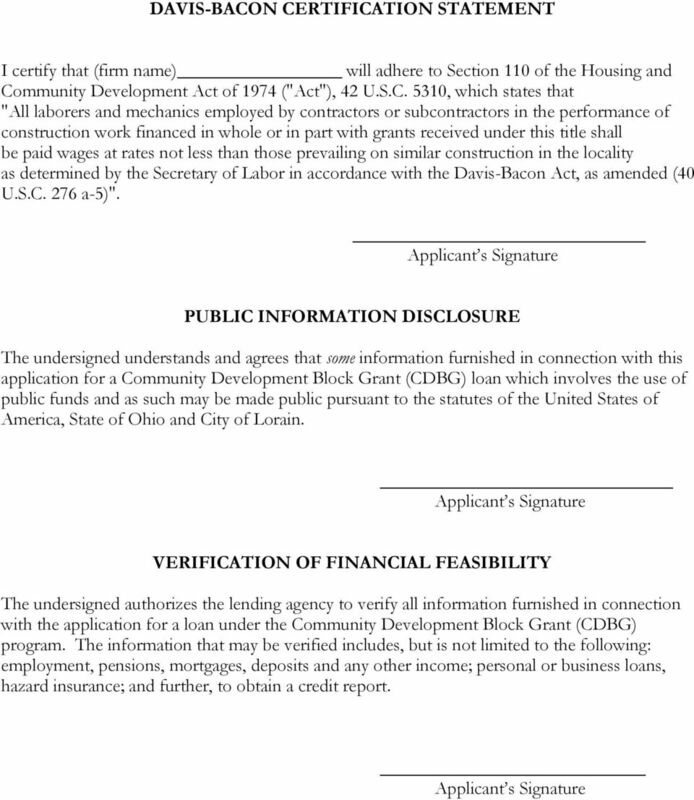 In the absence of substantial evidence to the contrary, an activity will be considered to address this objective if the City certifies that the activity id designed to alleviate existing conditions which pose a serious and immediate threat to the health or welfare of the community which are of recent origin or which recently became urgent, that the City is unable to finance the activity on its own and that other sources of funding are not available. A condition will generally be considered to be of recent origin if it developed or became critical within 18 months preceding the certification by the recipient. Firm Representative *Example of Urgent Need Assistance in reconstructing water lines owned by a private utility and destroyed by a major natural disaster such as a tornado or major flood, where other resources are insufficient or unavailable to address this imminent threat to the community. PITTSFIELD ECONOMIC REVITALIZATION CORPORATION 70 Allen Street, Room 205 Pittsfield, Massachusetts 01201 (413) 499-9371 (413) 395-0152 Fax J. Jay Anderson, President Ann W. Dobrowolski, Clerk Robert S.